Mt. Katahdin, the northern terminus of the Appalahian Trail. The Appalachian National Scenic Trail is perhaps the best-known hiking and backpacking trail in the United States. The trail extends an astonishing 2,184 miles from Georgia to Maine. After crossing Maine and reaching the Canadian border, some hikers continue on an unofficial trail extension called the International Appalachian Trail. The Maine section of the Appalachian Trail (AT) is regarded as one of the most challenging lengths of the entire trail, but its rich scenery and wildlife continue to draw day hikers and backpackers. Consider hiring a Registered Maine Guide to guide you on a day hike or overnight backpacking trip. Before hiking, always let a friend or loved one know your plans to ensure your safety. 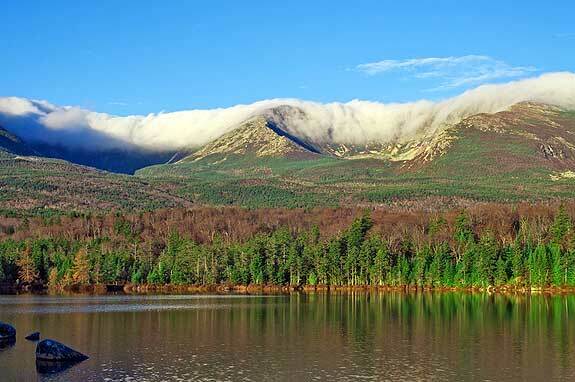 The AT begins at Springer Mountain in north-central Georgia and extends to Mount Katahdin’s Baxter Peak in Maine. Most thru-hikers begin in Georgia in the spring and work their way north to Maine. It typically takes between four and five months to complete an AT thru-hike. Baxter State Park officials recommend that thru-hikers begin after May 15th and before October 15th to avoid snowfall. The trail is marked with white blazes painted on trees and rocks. Side trails to shelters, parking lots, and viewpoints are marked with blue blazes. Some areas in Maine still feature diamond-shaped metal markers driven into trees. The Maine section of the AT consists of approximately 281 miles. The trail enters Maine at the Mahoosuc Public Land Reserve after leaving New Hampshire. Here, hikers face Mahoosuc Notch, sometimes called the “killer mile.” This challenging section of the AT requires hikers to climb over boulders, squeeze under boulders, and traverse steep drops. Even the most experienced hikers may take over an hour to complete this mile of the trail. After leaving Mahoosuc Public Land Reserve, hikers pass through Grafton Notch State Park and must cross Baldpate Mountain and Wyman Mountain. 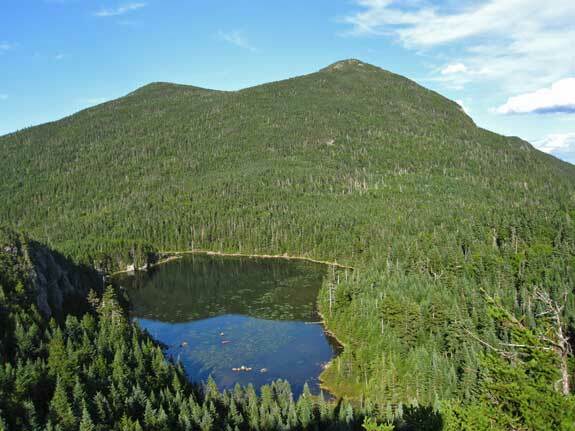 The trail continues east through the Rangeley Lakes Region, where the 4,116-foot peak of Saddleback Mountain provides one of the finest vistas of the AT. This section of the trail also features Piazza Rock, a broad boulder that appears to be balanced in mid-air. The AT continues to the 4,237-foot Sugarloaf Mountain, which is the second-highest peak in the state. After passing through Bigelow Preserve, the AT continues through the trail towns of Caratunk and Monson. Just before Caratunk, hikers must complete the only boat crossing along the entire AT to traverse the Kennebec River. A stretch of trail called “the Hundred Mile Wilderness” begins at Monson and extends east to Baxter State Park. The Hundred Mile Wilderness is considered the wildest section of the entire AT. Hikers experience solitude and frequent animal sightings along this stretch of the trail. The northern terminus of the AT is the 5,267-foot Baxter Peak of Mount Katahdin. Although not technically a part of the AT, some hikers also attempt a trail called the Knife Edge. This challenging trail leads to Mount Katahdin’s summit via a path only a few feet wide in certain areas. Only experienced hikers should attempt this trail, which is very dangerous in cold, rainy, or foggy weather. If you are going on a day hike on a section of the trail, be prepared for inclement weather or emergencies. Pack a bag with bug spray, food, 2 liters of water per person, topographic maps, a flashlight, a first aid kit, and warm weather gear. Individuals going on a longer backpacking trip should pack a tent, sleeping bag, cookstove, warm clothing, utility knife, and plenty of extra food and water. There are shelters along the length of the AT; these are approximately a day’s hike apart and are available on a first-come, first-served basis. Camping is permitted at designated sites along the trail. The Maine section of the AT is rich in biodiversity. Look for moose, white-tailed deer, rabbits, hares, and numerous species of birds. Less welcomed are encounters with mice, snakes, ticks, mosquitoes, and black flies. The AT also features old-growth forests, coniferous trees, alpine plants, mosses, lichens, and ferns. Pay attention to your surroundings to spot interesting flora and fauna. Bringing a plant or animal identification book can help you better appreciate the wildlife along the AT.